Nvidia CEO Jen-Hsun Huang says the pace of vehicle technology development is being dictated by smartphones. SAN FRANCISCO -- Nvidia Corp. may be relatively new to the auto industry, but it is making up for lost time. The Santa Clara, Calif., chipmaker, best known for graphics cards for video gaming systems, boosted automotive revenue more than 80 percent in 2014 by capitalizing on car companies' hunger for high-powered computers. Nvidia's automotive business remains small compared with that of infotainment suppliers such as Panasonic and Harman, or chipmakers such as NXP and Freescale. But the company's rapid growth reflects a changing market for infotainment. In the past, automakers wanted cheap, reliable computers that could last for a five-year product cycle. Now, many of them want more computing power for smartphone-style visuals and autonomous driving systems, CEO Jen-Hsun Huang said during an earnings call this month. "The fact of the matter is, you can't spend five years designing a car anymore," he told analysts. "Consumer electronics moves way too fast. People's expectations are set by what they have in their phones, and so you've got to move faster." Nvidia's customers include Audi AG, which uses a Nvidia chip to power both the infotainment system and instrument gauges in its redesigned TT sports car, and Tesla Motors Inc., which uses separate Nvidia chips to power the infotainment screen and instrument cluster of its Model S sedan. To date, about 7.5 million vehicles have shipped with Nvidia technology on board, up from 4.7 million a year ago. 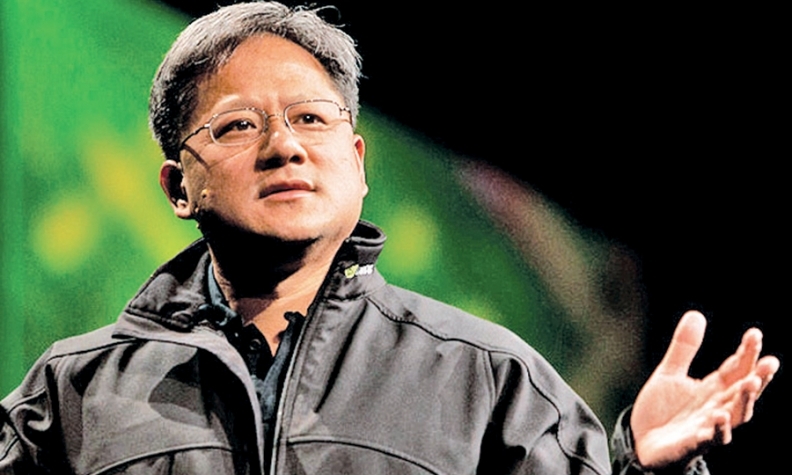 Huang told analysts that Nvidia won $1.9 billion in contracts in 2014 for another 16 million vehicles. "The most progressive car companies are moving at the speed of light now," Huang said. "They've taken their design cycle from five [years] to three, and I think I'm seeing them moving down to two, potentially one. And so this is going to be a brand new automotive industry." The change means more money for suppliers. Huang said he sees the vehicle as a "multithousand-dollar computer opportunity," with even entry-level vehicles needing a relatively sophisticated computer and high-end vehicles using more than one. This shift is helping Nvidia's rivals as well. Harman reported a 12 percent increase in revenue for its infotainment division in 2014. Freescale reported a 12 percent increase in sales of automotive microcontrollers. Some of these established suppliers are warning automakers about working with Nvidia. They say it could be unsafe to power an in-car computer -- in which reliability is paramount -- with chips used in smartphones, tablets and video gaming devices. Undeterred, Nvidia is betting big on Drive, its next-generation computing platform for autonomous driving and digital cockpit, which it unveiled last month at the International CES in Las Vegas. "We're one of the few companies in the automotive industry that can provide literally end-to-end solutions," Huang told analysts. "I see the car, long term, as quite a large opportunity for us -- not a chip opportunity, because we're not a chip company anymore."